Freedom of the Seas, one of the largest ships afloat, offers couples more ways to spend a day than any other cruise ship. Want to know how to make good use of your time aboard? Try this active itinerary on for size. Coffee, that is. Open your balcony door and feel the sun on your face. Call room service for coffee, juice, and croissants on your private deck. Hit the Deck 11's ShipShape Fitness Center. If you're into exercise, this facility rocks. Its roster of equipment includes 6 Pilates reformer machines, Life Fitness' Cable Motion Series, the only boxing ring at sea, and the Next Generation Power-Plate —a vibrating scale. Classes include iSalsamania (Latin-inspired dance workout) classes and The “Night Klub” indoor in a high-tech studio with night club-style lighting. After a quick shower at ShipShape, change into your bathing suits and wander out to the Squeeze Bar at the swimming pool area for a fruit smoothie with an extra dose of energy herbs in the mix. Sun, swim and relax at the Solarium, the adults-only swimming pool. Hankering for a big double cheeseburger? Head up one deck to Johnny Rockets, the 1950's theme burger joint, and live a little. Get there on the early side and expect to spend some time; it's popular and there's usually a line. 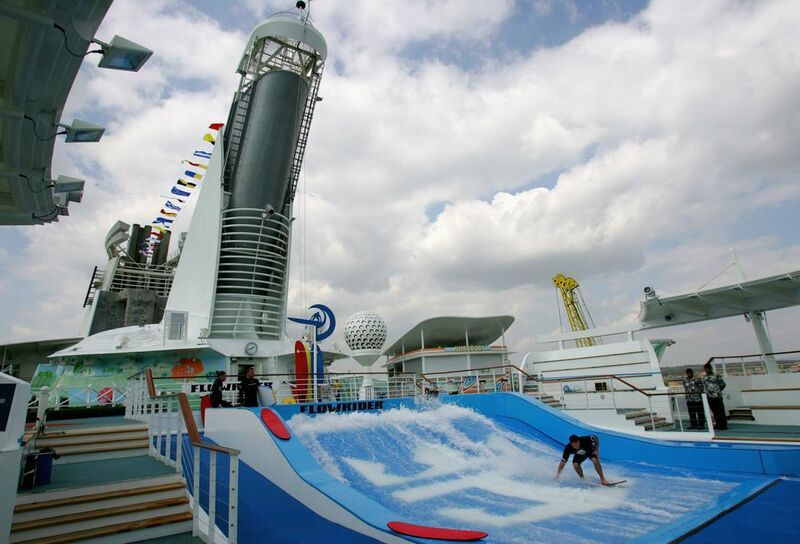 It's on to Deck 13 to cheer the surfers on the FlowRider, play a round of miniature golf, take a rock-climbing lesson at The Wall, and reward yourself afterward with a brew or nab a piña colada from the Wipe Out! Bar. Head back to the pool area for a dip and a soak in the cantilevered, adults-only whirlpool that extends 12 feet out from the side of the ship and soar 112 feet above the water. Or whatever. The beds couldn't be more comfortable. No further explanation necessary. It's down to Royal Promenade, the 445-foot long shopping, and entertainment boulevard, for a Ben & Jerry's ice-cream cone at and a cup of java at Latte-tudes. Drop into one of the shops for an evening bag and some jewels to go with it. Send your better half over to A Clean Shave for grooming. You're booked at the Freedom Day Spa for a massage, steam, and shower. Ladies, change into something sparkly; guys, put on your finest duds. This is a good time to try out more Freedom of the Seas bars. Imbibe bubbly at the quiet Champagne Bar or visit Vintages for wine tasting. Stroll down to the main dining room for late seating. Stop and have a formal portrait taken of yourselves looking tan, relaxed, and happy. Take your seats for the (free) skating performance in Studio B Center Ice. Walk up to the pool deck for some fresh air. Check out the glass-enclosed Viking Crown Lounge on Deck 14 for some jazz and quaff a martini at Olive or Twist. Later, head down to the Plaza Bar on Deck 11 for tea or sake. It's time to grab a late-night snack and then check out Casino Royale, where table games and slot machines reward the lucky. After you've made your millions, pay a visit to a ghoulish late-night lounge. Okay, now go to bed. There's a completely different — and equally fun-filled — itinerary for you to experience tomorrow.